When a loved one passes away, it is difficult to pin down feelings and emotions generated by a host of memories. Through a multimedia piece entitled “Traces of You” by Zubin Pastakia from the Copenhagen Institute of Interaction Design, digital information and social networks chronicling the life of the departed are integrated into materials that explore the grieving process. Using a combination of GPS and tagging data, the movements of the deceased are stitched as a memory-trail by those left behind into a tapestry. An email application archives past conversations, and an ambient display object is able to light up when the name of the departed is mentioned or referenced. Traces of You consists of three parts. The first is called “The Places You Went…” which uses GPS data, status updates, and location tagging to recreate the movements of the departed. The loved one can generate a memory trail, picking the most salient and emotionally significant places along each route. 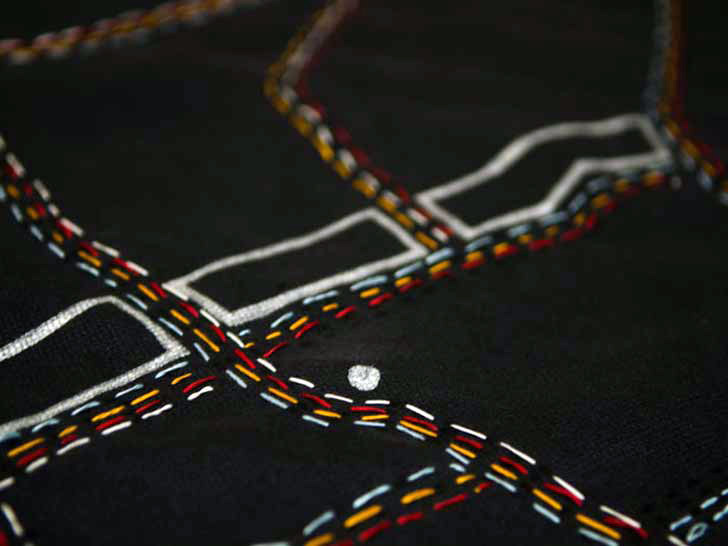 A map is traced along a large piece of fabric, and can then be embroidered with different colored thread. While the griever is completing the tapestry, an application can be accessed revealing digital pictures and quotes corresponding to the textile. The second section is called “All the Things You Said”, or “Reminiscence” and works with an email plug-in that lets users look back at archived conversations. Similar to an existing Gmail tool, users can search for keywords. By clicking the “Reminiscence” button, a minimalist screen emerges that brings forth snippets of each time where the word was mentioned and the date. Able to run their fingers over the screen, the interaction is faster than Gmail’s current system and designed to add an emotive experience to a search. A “Read” icon then lets the person select a conversation in order to peruse the full version of the text. The final part of the suite is named “Vestigial Flicker” and combines candle-like object that lights when Internet network activity mentions the departed. It also sends a feed directly to the loved one as a means of creating a sort of virtual afterlife. Similar to the eternal flames lit by the sides of graves, the candle helps keep memories alive through the actions and recollections of those still alive. Inspired by a talk on interaction design by Matt Ward, Zubin Pastakia got to thinking about what the dead leave behind in a world now filled with digital recordings of their lives. “This got me thinking about what kind of traces people leave behind when they pass away? They leave behind material things (clothes, houses, cars, computers), social connections (family, friends) and immaterial things (memories, bank acounts). I then asked, what was new about what people leave behind when they die these days, and the answer, quite categorically was: data. All kinds of data. Data in the form of correspondence, location-based data, social-media accounts, health…” says Pastakia. After meeting with seven people in Copenhagen and five online, Pastakia began to integrate first-hand experience of loss with knowledge of design and technology. Filling the void modernity seems to have placed around death, “Traces of You” is a unique, and somewhat haunting, way of remembering and holding onto what has physically passed away. The prototype is also a compelling concept for social networking companies and a possible guide as to how the services can deal with the “emotive data” left by the deceased. When a loved one passes away, it is difficult to pin down feelings and emotions generated by a host of memories. Through a multimedia piece entitled "Traces of You" by Zubin Pastakia from the Copenhagen Institute of Interaction Design, digital information and social networks chronicling the life of the departed are integrated into materials that explore the grieving process. Using a combination of GPS and tagging data, the movements of the deceased are stitched as a memory-trail by those left behind into a tapestry. An email application archives past conversations, and an ambient display object is able to light up when the name of the departed is mentioned or referenced.